We're in for some exciting baseball as the regular season is about to close out this weekend. The Railroaders find themselves a half game back of the Pirates and their fate in their own hands. The doubleheader sweep of the Bobcats on Friday was just the beginning of the final stretch drive to win the season title. We have to face off with the Cats again today in a doubleheader which could put us ahead of the Pirates by a half game. The Pirates play a doubleheader with the Middle TN Cougars today, in games that will not count towards a season title. Only games with KIT teams count toward final season standings and post season playoff positions. 1) If we sweep the Bobcats today and win in Tradewater tomorrow, the title is ours. 2) Lose one today and win against the Pirates on Sunday would give us half game lead and force a game on Monday against the Oilers in Owensboro (a PPD game makeup). A Monday win would then tie Fulton & Tradewater (don't know what that would create). 3) If the Bobcats take both games today and we beat the Pirates tomorrow, a Monday win would also tie us with the Pirates for the title. 4) A sweep of the Bobcats and a loss to the Pirates would force a Monday game to play for a title tie. 5) Lose one today and a loss to the Pirates on Sunday would give the title to Tradewater. So let's start it today with another double win over the Bobcats. 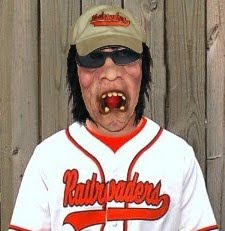 We'll need all the fans out to cheer the Railroaders on. The guys are fired up and are finishing season strong. The road record has improved to .500 and our chances look good to take all the marbles. With the Browns putting down the Pirates on Wednesday 12-5, we find ourselves tied with Tradewater in the overall season standings. For Playoff seeding (based on Kitty League games only), the Railroaders are 0.5 games behind the Bucs. With 5 (maybe 6) games left, every game counts now. Thursday's another day off to rest, and rest is what we'll need as the weekend approaches. Friday a doubleheader with the Bobcats in Marion, and Saturday another doubleheader with the cats in Fulton. And then there's Sunday's single game in Tradewater and it could be a really big one depending how the teams do before the day arrives. The Railroaders may have to play on Monday in Owensboro if a decision in the standings is at steak. The Bobcats are playing tough and will want to spoil our push for the Season title, while trying to better their Playoff position in Kitty League only standings. They want the 3rd spot from the Oilers. We are in control, so let's make the most of it as we push towards the #1 spot for 2010! ". . . Fulton is 20-11 in KIT League play with eight games left against league opponents, including one with Tradewater and four with Marion. Tradewater is 24-12 in the circuit with only four KIT League games left, putting their magic number at 6 to clinch first place. The Railroaders, however, control their own destiny. Even if the Pirates win their last four league contests, they are not guaranteed a first-place finish. Fulton would have to lose at least two of its remaining eight games to ensure the Pirates a regular season crown. Owensboro also has an outside chance at first place, but must win all of its remaining nine games and hope for the Pirates to win no more than one of their remaining four games. For Marion, a first-place finish is out of reach, but the Bobcats can still hope for a second-place finish. However, they must also win outright and hope for no more than one Fulton victory. To achieve third place, Marion is only 3.5 games behind Owensboro with three head-to-head match-ups with the Oilers remaining." Pretty good words for the Railroaders to consider as they head into a busy week of baseball. Tonight, Monday, we have the Oilers in town and then on the road through Friday. Saturday a big final home season doubleheader with the Bobcats. Let all get out to the Yard and cheer the team on.